Many individuals are unaware that protecting their garage doors is just as important as the window and entry doors of a specific home. Catastrophic loss of pressure especially associated with severe Cat 4 and Cat 5 hurricanes, gains its way into your residence via the garage door opening. This loss of pressure is much more severe than losing a window or door as the opening is larger increasing the risk of roof—then whole home failure. The larger the opening, the more vulnerable it usually is. When a Category 4 or Category 5 storm hits your neighborhood—the extremely low-pressure associate with the storms actually can do more damage than the wind. Here’s how it works. When a Cat 5 storm hits, the high pressure in your home is trying to escape—so there is actually as much negative pressure (the sucking action against widows and entry doors) as there is positive pressure (the wind load or wind against your home—the blowing action). Once an opening of your home is compromised then the entire home is compromised and the garage door should be viewed as a large entry door and not just the garage. Many individuals actually keep their garage doors rolled up and just deploy their hurricane fabric so they have another vantage point to see the storm. 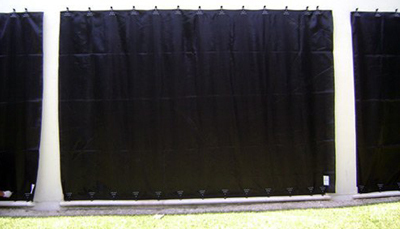 Choose Hurricane Fabric and be safer during a storm! !